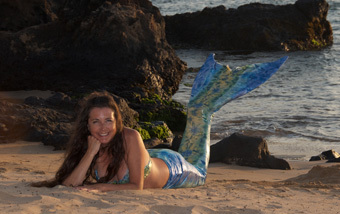 Mermaids International was created to celebrate the mythical and mysterious merfolk of the sea. Yes, they exist! I owe my swimming ability and love of the water to my mother who never had a chance to learn to swim properly. She grew up in the wilderness, and while people in the cities and towns had electricity and running water, her childhood was one of kerosene lamps, ringer washing machines, wood stoves and hauling water from the spring. As a child she never had a chance to learn to swim -- and wouldn’t you know that she eventually married a man (my father) who owned a boat store. That meant summers spent on the water boating, swimming and water skiing. She had to adapt quickly to water which she had never felt comfortable in. My mom determined that her children would be strong swimmers and so she enrolled me in the local swim team when I was old enough to join. Swimming five times a week, working on strokes, strength and speed, I soon became a strong swimmer. When I was introduced to monofinning in 2010 I thought I’d died and gone to heaven. The speed with which I could propel myself through the water made swimming seem like plodding. Top speed for the Finis Competition monofin is 11 km an hour. And while I certainly don’t go that fast, I do enjoy the fact that I could if I tried hard enough. As a child I was raised on a rainbow trout farm and my grandfather had another trout farm upstream. The streams ran through green valleys and were covered over with a canopy of evergreen trees. More trout lived there than one could imagine. They moved through the clear water with such elegance and grace. I would watch them for hours. They had a sense of adventure and were curious too. They would swim up to my fingers in the water and let me tickle their bellies. Then they would dart away only to come back a few minuets later for another tickle and another dart away. I have very fond memories of those beautiful underwater creatures. When I was introduced to monofining it took me back to my shiny water companions of my youth. I had another underwater hero -- Skana -- the large killer whale at the Vancouver Aquarium. The first time I saw Skana, it was love at first sight. I told my dad that I wanted Skana to come home with us -- all very logical to a five-year-old! Now, with my monofin I can move through the water emulating the power and grace of Skana. It is a dream come true. 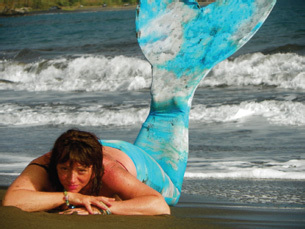 I invite everyone to unleash their inner whale or dolphin -- or mermaid -- and yes -- mermaids really do exist!